Dunay radar (Russian: Дунай, tr. 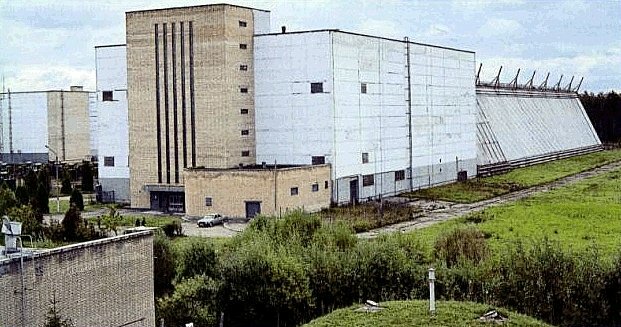 Dunay literally Danube; NATO: Cat House, Dog House) was a system of two Soviet radars used to detect American ballistic missiles fired at Moscow. They were part of the A-35 anti-ballistic missile system. 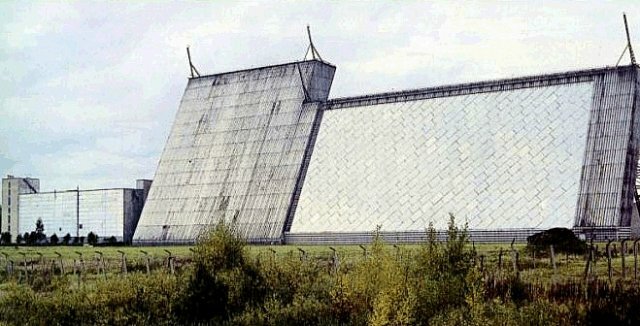 One sector of one of the radars, the Dunay-3U ("Cat House") is still operational and is run by the Russian Aerospace Defence Forces as part of the Main Control Centre of Outer Space. The Dunay-2 was a prototype built in Sary Shagan as part of the experimental missile defence system "A". It consisted of separate transmitter and receiver complexes separated by 1 km. The power of the radar was 100 kW and its range was 1,200 km. The NATO codename was "Hen Roost". The Dunay-3 (Russian: Дунай-3М, tr. 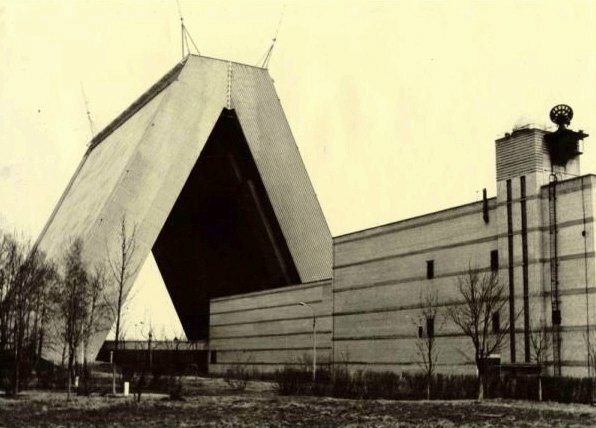 Dunay-3M; NATO: Dog House) was an upgrade of the Dunay-2 located in Kubinka, Moscow and became operational in 1968. Following an extensive upgrade in 1978 it was renamed Dunay-3M as part of the upgraded A-35M ABM system. It consisted of separate receiver and transmitter buildings separated by 2.5 kilometres (1.6 mi). The transmitter covered two sectors (roughly north and south) and its array was 200 metres (660 ft) long and 30 metres (98 ft) high. The power of each sector was about 3MW. The receiver was a building 100m x 100m containing 2 passive electronically scanned array radars as well as the command and control centre for the A-35 system. The range of the system was 2,500 kilometres (1,600 mi). The radar was functional until it caught fire on May 8, 1988. This was a prototype of the Dunay-3U and was located in Sary Shagan test site. It was given the NATO codename "Top Roost". The Dunay-3U (Russian: Дунай-3У, tr. Dunay-3U; NATO: Cat House) was built in 1978 as part of the upgraded A-35M anti-ballistic missile system. It is located in Chekhov and was structurally similar to the Dunay-3M - it has a separate receiver and transmitter separated by 2.7 kilometres (1.7 mi). There are two sectors. It was capable of identifying the launch of Pershing II missiles from West Germany. In 1995 A-35M was replaced by the A-135 anti-ballistic missile system which used the Don-2N radar. One sector was decommissioned in 1998 and is now ruined and the other is used for space surveillance of satellites in low earth orbit. As a UHF radar it can identify smaller objects (15–40 cm) than the VHF radars such as the Daryal and Dnepr. The Dunay-3U was commissioned in May 1978 with a life of 12 years. Both sectors were extended until 2000 but one sector (62) was decommissioned in 1998. The other one (61) has been extended in 2001 and 2005 - the last extension was until December 2009, but it may have been extended again. In 2012 the Russian Ministry of Defence issued a tender for the demolition of sector 62. Before 2003 the transmitter had 30 waveguides each excited by a 100 kW transmitter Since 2003 the station has been operating at a reduced power of 500 kW rather than 1800 kW, with 12 transmitters (out of 24) rather than the previous maximum of 30. The radar is chirped. The radar's computer system is made up of 10 K340 computers. ^ a b c Podvig, Pavel (2002). "History and the Current Status of the Russian Early-Warning System" (PDF). Science and Global Security. 10: 21–60. CiteSeerX 10.1.1.692.6127. doi:10.1080/08929880212328. ISSN 0892-9882. Archived from the original (PDF) on 2012-03-15. ^ Bukharin, Oleg; Kadyshev, Timur; Miasnikov, Eugene; Podvig, Pavel; Sutyagin, Igor; Tarashenko, Maxim; Zhelezov, Boris (2001). Podvig, Pavel (ed.). Russian Strategic Nuclear Forces. Cambridge, Massachusetts: MIT Press. ISBN 978-0-262-16202-9. ^ O'Connor, Sean (2009). "Russian/Soviet Anti-Ballistic Missile Systems". Air Power Australia. Retrieved 2012-01-07. ^ "Cat House". Federation of American Scientists. 2000. Retrieved 2012-02-20. ^ Lukin, Mikhail (2012). "Brief Summary of Russian Defense Procurement Contracts in June-July 2012". Moscow Defense Brief. 4. ^ a b Holm, Michael (2011). "1st Administration". Soviet Armed Forces 1945-1991. Retrieved 2012-02-24. Wikimedia Commons has media related to Dunai radar.